The US election is over, and despite the reactions of many, this wasn’t a black swan event. It could hardly even be called a fat tail risk. Yet, an event that markets were giving between a 15% and 30% chance did in fact occur. Donald Trump now comes to power in an era of single party government, with the GOP controlling the House of Representatives and still barely in control of the Senate. We’ve been sharing some quantitative insights on the topic throughout the cycle, and in this post will follow up to see how things worked out. These are daily returns, so the dashed line of the S&P 500 does not show the panic that occurred on election night, as futures dropped 5% before being mollified by a Trump victory speech that was far more conciliatory than expected. One high profile figure buying into the market panic was Carl Icahn, who as a friend of the incoming president was in a position to believe that the market was reacting improperly to Trump’s victory. In fact, the election has led to a rally as investors once worried about an anti-establishment candidate burning down the system are now more focused on coming cuts to corporate tax rates and hopes for fiscal stimulus through infrastructure spending. In this environment, the 12M Beta factor is noticeably underperforming the market rally, and the best performing factor this month has been Book/Price. Companies with low B/P are often tech stocks, and they face dual risks if the Trump administration moves forward on some of the campaign promises around trade and immigration. Berkshire Hathaway, whose portfolio we found to look like it would be relatively better off under a Trump victory, is up over 8% this month. It’s 13F portfolio was up just 3%, so many of the gains come from wholly owned subsidiaries that are poised to benefit from infrastructure spending, tax reforms, and a Trump administration regulatory regime. 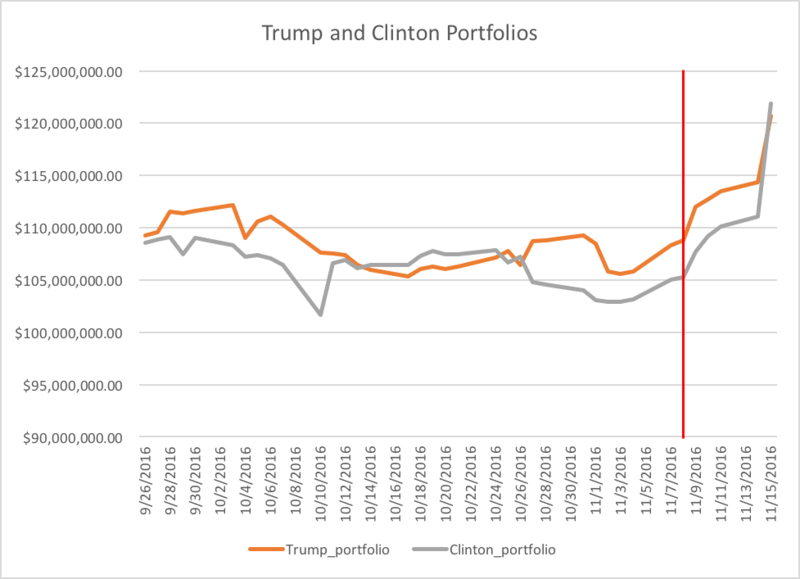 In the immediate aftermath of the election, Trump names outperformed as was expected. But more recently, the Clinton portfolio has caught up. What happened is pretty simple, the market was caught completely flatfooted by Trump’s signals that he would be very friendly to banks. Among his first announcements were discussions about how Dodd Frank could be rolled back. XLF, the Financial SPDR ETF, is up over 10% since Election Day. Many of the Clinton stocks were financials, and these companies are benefiting. Even H&R Block, which fell the day after Clinton’s election, handily recovered over the next few days. 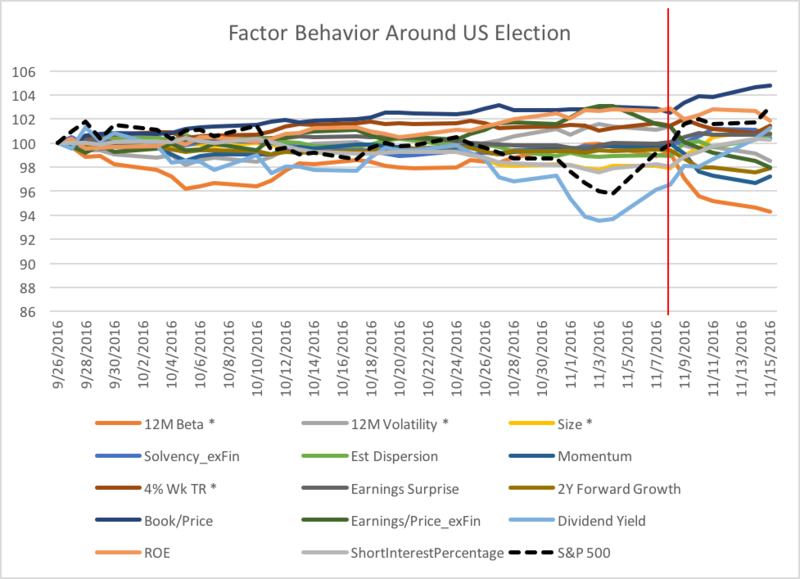 The surprising performance of our Clinton index stocks is indicative of the fact that investor expectations around this election changed significantly after the incoming administration started releasing announcements around their intentions. This highlights one way to use this type of factor analysis: to determine what the market believes in order to bet against the consensus. One of the challenges of portfolio management is that it's hard to get a clear picture of market expectations. Our prior analysis showed that investors saw financials at risk in a Trump presidency. Anyone who believed that a Trump victory would also be good for financials was very comfortable being long financials into an election in which most investors thought that a Clinton victory would be bullish. That piece of insight would have allowed investors to find an exceedingly rare heads I win, tails I win scenario. It hasn't been two weeks and the Trump administration has already surprised market watchers. The uncertainty and volatility over his presidency will drive the market both up and down. It’s now more important than ever for portfolio managers to manage their exposure to factor risks. Most portfolio managers are in the business of having a view and taking risks in order to generate alpha. Having the ability to measure various types of factor exposures simply cuts down on some of the unknown, unwanted, and unmeasured risk. Click Here to see how Omega Point Portfolio Intelligence can provide you with this ability. Click Here to download a spreadsheet showing how the Trump and Clinton buckets performed the day after the election, and what they've returned since then.